Attention to detail. No more machines. Create with love. Twirl like no one is watching. This ensemble will evoke your creative, free willing spirit; have you making your own butter and almond milk and learning the fine art of composting. No more paper towels. Too wasteful. Is that welding class at the artists' guild still available? You saw an old record player in the attic. Dad's jazz collection is somewhere. You'll give it shot. You're open to such things now. 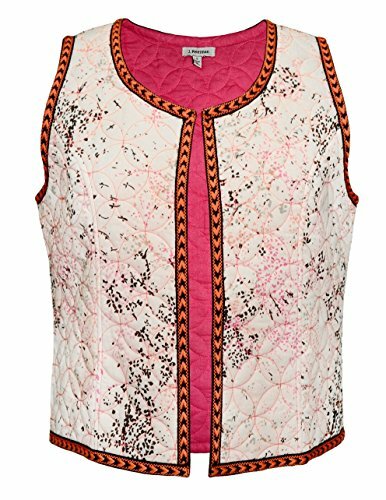 The Create-With-Love Quilted Vest (No. 4928). Quilted with overlapping circle pattern stitched in azalea pink. Open front (no closure) with slightly cropped length. 100% cotton. Scoop neckline. Eye-catching black and coral woven trim along all edges. Fully lined in solid Azalea. Made in India. Quilted with overlapping circle pattern stitched in azalea pink. Open front with slightly cropped length. Eye-catching black and coral woven trim along all edges. Hand wash cold with mild detergent, do not bleach, hang to dry, use warm iron if desired, do not dry clean. If you have any questions about this product by J. Peterman, contact us by completing and submitting the form below. If you are looking for a specif part number, please include it with your message.